Today my commute to work took all of 5 minutes. I woke up, brushed my teeth, put on my uniform and started up the stairs. My office was ready and waiting as I stepped onto Inde to check the guests tanks. The view was beautiful, as far as the eye could see a misty veil lay on the sitka-ceder coastline and the silvery blue water laying placidly living up to its rarely accurate name, Pacific. All in order with the tanks, time for a morning coffee and see whos up and about. Our guests this trip are a lively bunch with many dives under their belts but they hail from a mostly fresh water background. I love to see the guests excitedly pointing out decorator crabs and stevens hermit crabs, to hear them gush about giant plumose anemones and to see them pouring through the books with me in the evenings looking for exactly what neudibranch we saw today. Not to mention that our coastal showstoppers, wolf eels and giant pacific octopus have them clapping their hands underwater in glee. Some of these things us west coasters may take for granted but it only takes one guest excitedly pointing to a opalecent neudibranch to help me see the splendor we have in our back yard with renewed eyes. I am unbelievibly lucky to have been bron here and even luckier to have the chance to make my living under the waves. You can’t see this stuff any where else in the world! It is definitley worth the effort of getting into my drysuit! It’s like there is wall paper everywhere. Everywhere I look there are so many interesting and beautiful things to look at! 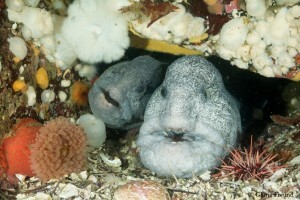 On our dive at fantasy island you couldn’t go two feet without seeing like 2 wolf eels! And there was no place to put a finger down to steady yourself because everything is covered in life! There were so many shrimp it looked like the sea floor was covered in popping popcorn! They were jumping everywhere! 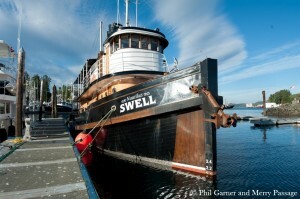 This is my third time coming back for a trip aboard the Nautilus Swell, it is my favorite live aboard. The boat is so beautiful and very comfortable and I love the exciting cold water dives. Today we dove with sealions at Grindall island, I always like diving with sealions and these ones were very inquisitive and interactive. They were mouthing my head, tugging on my hood and my mask. They nibbled my fins and camera. It was so exciting! I made some very good sealion and me selfies! The dives at Misery Island were very good. 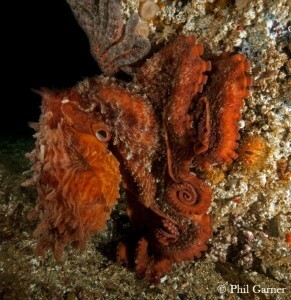 I saw a huge giant pacific octopus in his den. I have never seen such big octopus and puget sound king crabs! I took alone time in Baranoff warm springs for the first and last time. What a wonderful place on earth. It will stay in my mind and be thoroughly missed. Baranoff lake on a clear day with the snow peaks, waterfalls and sunshine is one of my favorite places on earth. Back aboard the Nautilus Swell, I have returned for my final contract. 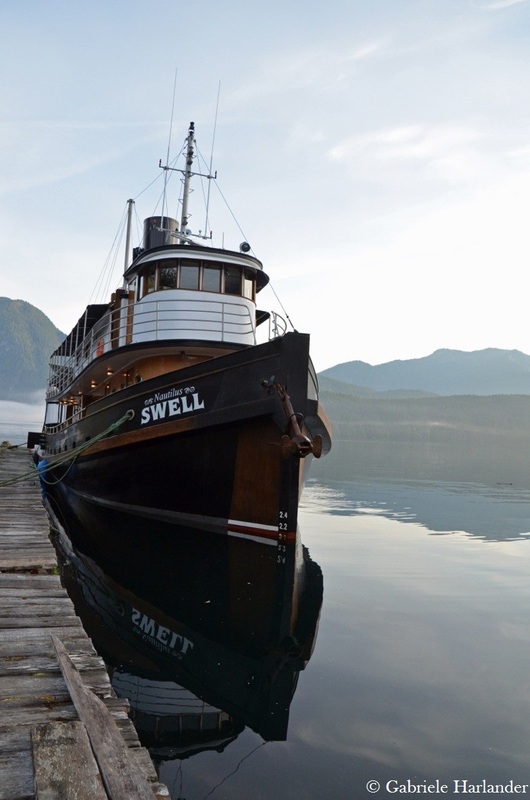 I feel incredibly lucky to be on the last trip the Swell makes traveling from Alaska to B.C. It is sad to see these places in Alaska for the final time, I have been coming up here to work on the Swell for over a year now and places like Baranoff hot springs, Myers Chuck, Petersberg, Elfin Cove and many more have made a mark on my heart. The diving I have experienced working aboard the Swell has been like no other. Dive sites such as ‘Kelp Patch’, the wreck of the Princess Sofia, the wreck of the Marc Christopher, Basket Bay, Misery island, the famed Wooden islands and Inian Islands have all left an impact on my life and created some spectacular memories. The crew aboard the Swell on these last few trips are wonderful people and they make working on Alaska’s only liveaboard dive boat the best job in the world. The guests who join us for sizzling cold water adventures are filled with experience, stories and knowledge and it is always a pleasure to get to know them. I feel blessed to have had the opportunity to dive Alaska and I look forward to another couple months of Diving in beautiful British Columbias waters. “There is no specific moment that stands out more than the rest, it has all been amazing. After the first two days we saw and did so much that we created enough memories to last the entire trip. I really liked the sealions, they were everywhere. It is a pleasure doing holidays with the Nautilus”. “I would come again and again 1000 times back to the Nautilus Swell! I am very sad that I cannot but am oh so happy to be on the final Alaska trip. I like everything so much. You come up from an amazing dive and see huge mountains everywhere and are greeted with hot chocolate and fresh cookies. Perfect! 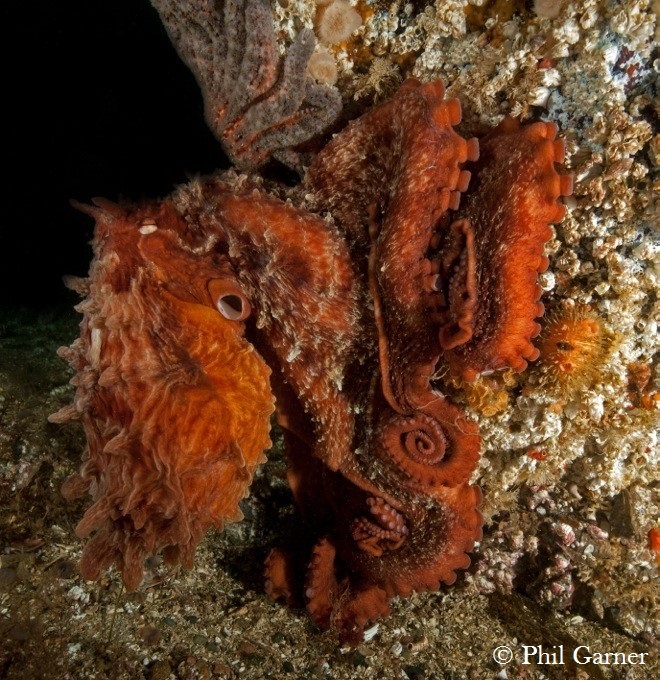 From adrenaline pumping sealion dives to nudibranchs to octopus, everything is too good. The food is so tasty and the boat so cozy”. I have over 700 Dives and this was the best dive of my life! I can’t ever remember surfacing with such jubilation! This trip aboard the Nautilus Swell has been fantastic. The expertise and knowledge of the crew really adds to the experience, they aaren’tjust familiar with the sites and animals but they know the tides, currents and interactions between species on every dive. “I have over 700 Dives and this was the best dive of my life! I can’t ever remember surfacing with such jubilation!” Merry, USA upon surfacing from a dive on Browning wall. 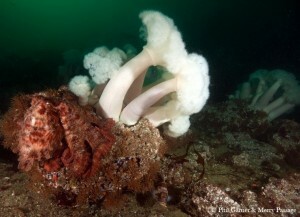 I watched a giant octopus glide down a wall of anemones to meet me on the rocky bottom where he began to approach me. Another epic dive yesterday off the Nautilus Swell. I watched a giant octopus glide down a wall of anemones to meet me on the rocky bottom where he began to approach me. The focus he had on me was intense, each tentacle moving independently of the rest he crept towards me with no fear. I don’t think I’ve ever seen such fluid, interesting movements from a creature underwater. Amazing experience. 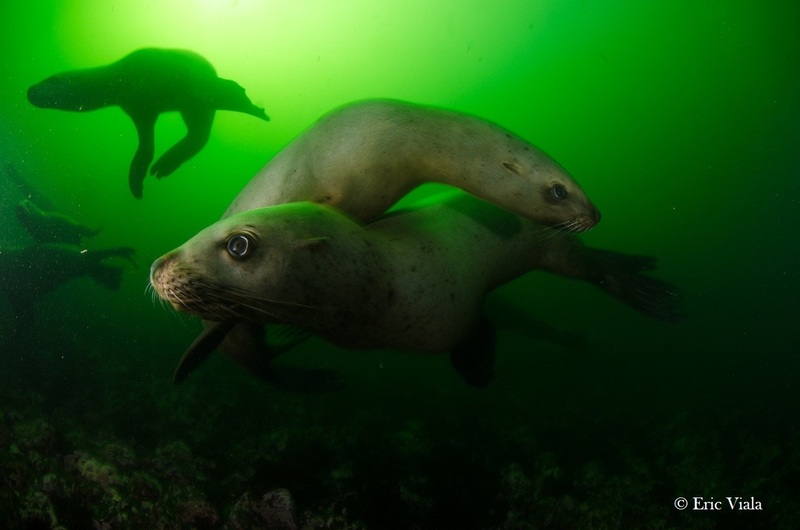 The dive was finished with a some playful action from the stellar sea lions. Can’t wait to get in the water again. Renae. Diving in Browning Pass is like diving in a fantasy land! I’m so happy to be part of this adventure. The abundance of life underwater blew me away. 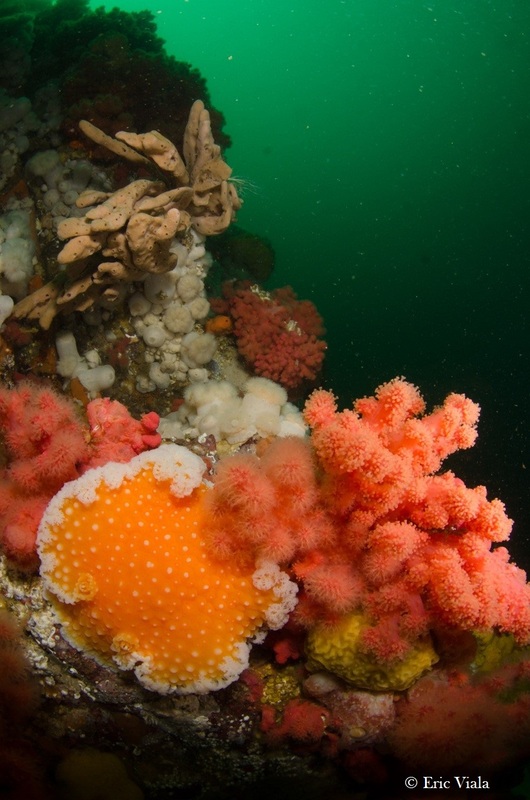 I have dived in other parts of Vancouver Island, which were lovely, but they don’t compare to the rich ecosystem I’ve experienced here in Browning Pass and the surrounding areas. 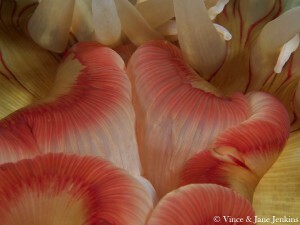 The layers of anenomes, and sponges of varying colors were more impressive than anywhere else I have dived. I felt like I was in a fantasy land. I loved it! This is a special part of the world. I grew up on Vancouver Island and have just returned from 7 years of travelling abroad. I am now appreciating the pristine beauty of my home more now than ever before. The awesome setting, the character of the Swell, my crew mates, and the diving, have made my first trip working on the Swell an experience I won’t ever forget. Day four of this Port Hardy trip and each dive has been more beautiful than the last! Today we dove the famed Browning wall, a cold water dive meca for divers world wide. The wall did not disappoint. As we cruised by we saw thousands upon thousands of plumose anenomies that carpeted the wall. Interspersed between the plumose, brilliant pink soft corals swayed softly in the slight current. Sponges were abundant, with lots of orange peel, opalecent and dirona neudibranchs snacking on them. Thousands of puget sound rockfish swam upwards or downwards on the wall, making me loose my sense of direction more than a few times. As I shone my light on them they twinkled like stars in the rich green water. On our safety stop we found a large giant pacific octopus at 16ft, tucked into a crevass, he eyed us suspiciously until we went away. Our last dive of the day was Buttertart, the first dive I ever dove aboard the Nautilus Swell. With over 150 cold water dives since then, it was interesting to come back in full circle to the familiar dive. As we descended in the kelp forest we passed by thousands of hooded neudibranchs, dancing in the water column and many more jelly fish, placidly pulsing away. Over a ridge and we swam top o left along a beautiful wall. 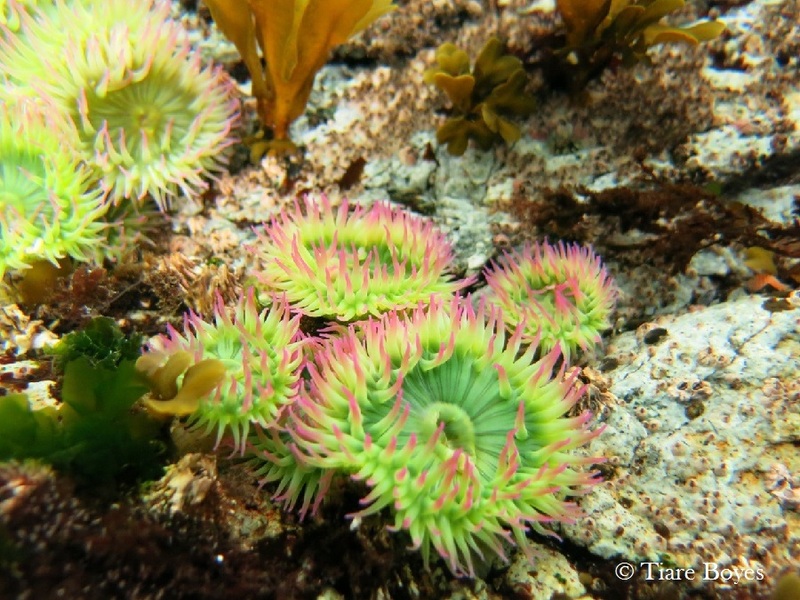 Similar to Browning but with more plumose, I shone my light into the cravasses and found a huge wolf eel, puget sound king crabs, decorated warbonnets and thousands of decorator crabs and sculpins, smooth headed and longfinned. Passed the rock, we came back up to do our safety stop in another kelp forest. 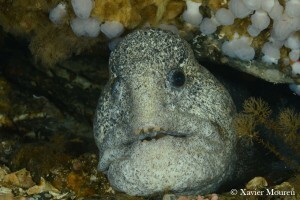 This time hundreds of dusky rock fish joined the multitudes of hooded neudibranchs and jellies. In my over stimulated dive brain I decided the rock fish had accepted me as one of their own as we swam together through the underwater forest, and I decided that I could happily spend the rest of my life in a kelp forest. Long past the 3 minutes I lingered in the sun dappled fronds until I poked my head up and signaled ‘OK’ to Inde and Captain Tim who came over to pick me up. A great day diving in Browning Pass! And many more to come! As I pull the honey whole wheat buns from the oven the smell of fresh bread fills the galley and drifs out in the salon. Suddenly I see the portal to the dive deck filled with curious faces as divers preparing the board the skift catch a wiff of the wonderfull smells. I break open a fresh bun to check my handywork, and quickly end up giving out four buns to sudenly hungry and smiling guests. Through the galley door I see the serene landscape of browning pass, glass like water broken by playong porpusis. Once again I stand in aww at the world we live in and the place I get to call my work.